The weather took a major turn for the worse this week (12-19 May 2017) – it’s hurled down for most of the week, the garden certainly needed it – everything was really parched. But, all the rain meant I didn’t get into the garden much, let alone anywhere else. I’ve also been feeling very tired, and arthritis pain is high. However, I’m continuning to note down activities, people and things that make me happy or I’m grateful for. As ever, major thanks to Suzy from www.fromthefringe.co.uk who hosts this weekly gratitude link up. I think she’ll recognise the lighthouse, as she lives around the corner from me 🙂 Also to Emma from www.misspond.co.uk who inspired me to blog and also writes regular posts on Happiness. Thank you ladies. One of the things, I love about blogging is meeting (usually virtual) new friends, finding a community and developing a network of people all around the world. I’ve been very grateful for them all these last couple of years. I’ve written a few times about WI means to me; the fun, camping, adventures and excellent meetings and speakers – it’s most definitely not jam and Jerusalem – it’s been a campaigning organisation since its inception in 1915, lobbying for equal pay, The WI were founding members of both the ‘fair trade’ and ‘Keep Britain Tidy’. One of the great things about all the new WI’s around Great Manchester is we do lots of joint activities and people attend other WI meetings – so I know ladies all over the city. So on Thursday I went off to see the Salford Angels and had a lovely evening, with plenty of cake. My Chap and I went for a walk around the neighbourhood after we’d had our tea. It’s something we do often in the summer evenings. We have a good look at all the flowers and plants in front gardens, noticing plants for our garden. It was lovely to chat about this and that, nothing complicated or heavy, just a good chat and a laugh or two. We are lucky to live in Monton, in Salford. It’s very green place, the Bridgewater Canal is at the end of my street, Worsley Woods are a mile, or so away, and there’s a couple of golf courses (not that we play – but there are many footpaths). There’s even a parkrun at the end of our street. It has a lighthouse that’s 30 miles from the North Sea (it’s really a garden shed) – just another reason why Monton is a bit quirky. 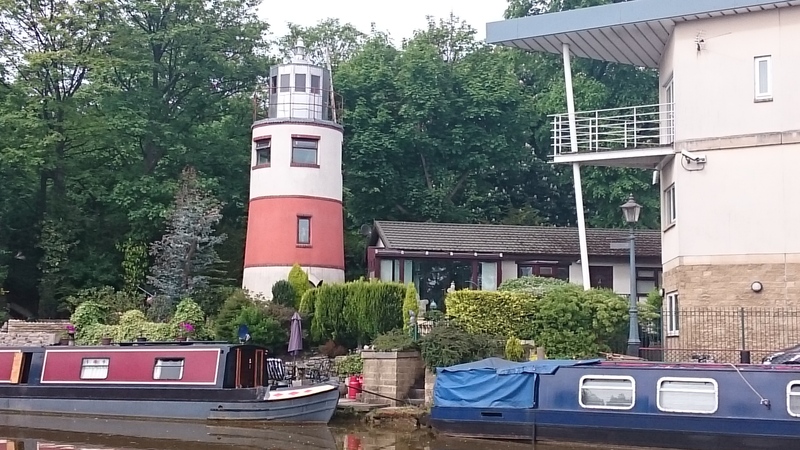 19 May 2017 – the lighthouse by the Bridgewater Canal, at Monton, Salford -30 miles from the sea! I had a great time catching up with my good pal, hearing all her news and discussing my news – it really lifted my spirits. She’s a good listener. I’ve known C for over 12 years, we shared an office at work. She’s an IT geek and I’m not 🙂 Our birthdays are a couple of days apart, we usually go out to celebrate our birthdays, involving cocktails. Annual trips to Manchester Christmas markets, days out to Dunham Massey. Shes part of the Cottonopolis WI posse too – and obviously, she and her husband will be at our wedding in September. This week my Gardeners’ World and Royal Horticultural Society Magazine arrived. I’ve spent quite a bit of time looking through deciding what we might plant, or if money and space were available. The Gardeners’ World is very accessible for beginner gardeners like me, the RHS one helps with plant pests, plants that might suit our shady, north facing soggy back garden – and Latin plant names too. This entry was posted in 100 happy days project, Life, Manchester and tagged gratitude, Great gardens, happiness, monton, RHS, Women's Institute on May 22, 2017 by Bec - views from my garden bench. This entry was posted in 100 happy days project, Great gardens, History and tagged #100happydays, Alnwick castle, daffodils, Great gardens, Wordless Wednesday on April 27, 2016 by Bec - views from my garden bench. This entry was posted in 100 happy days project, Food and Drink and tagged #100happydays, lemon drizzle cake on April 20, 2016 by Bec - views from my garden bench. This entry was posted in 100 happy days project and tagged #100happydays, In a vase on Monday, jug, painting, pottery painting, vase on March 23, 2016 by Bec - views from my garden bench. This entry was posted in 100 happy days project, Cornwall, Food and Drink and tagged #100happydays, chocolate, Wordless Wednesday on February 17, 2016 by Bec - views from my garden bench.